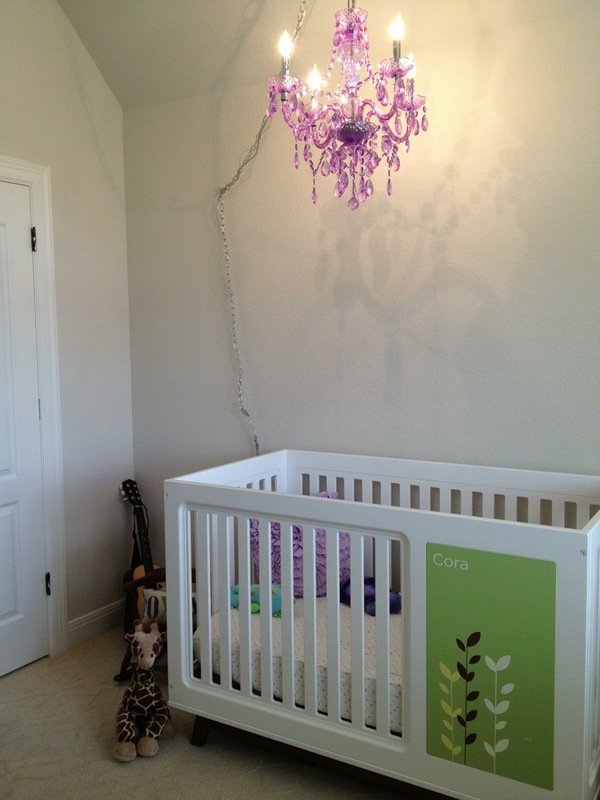 We went with a simple way to add some seriously girly drama to Cora’s room with a purple chandelier! Our little big(ger) girl has declared herself a princess and is no longer interested in mobiles. It was the perfect way to glam up her room with one update. Here’s a link to the chandelier we used. It’s also available in black, clear, blue, green, and red! We purchased a hook to hang the light seperately. The included one was flimsy plastic so not good enough to hang over our little one’s bed. We made are that the hook hanging the light was secured into a stud. No drywall anchors here, even though it meant moving the bed over a bit to center it. The plastic “chrome effect” hook did get some use. It’s routing the extra chain & cord away from the bed. We hung this as a swag lamp instead of replacing the ceiling fan because this is Texas and we use the heck out of our ceiling fans. We made sure there was plenty of clearance between the fan & chandelier. There was a switch on the cord already, otherwise we would have added one. For baby proofing, we covered the lower part of the cord with plastic cord wrap.